Ah, Springfield Heights Institute of Technology. It turns out there is a long and time-honored history of urban legends wherein some institution, business, or school inadvertently wanders into an embarrassing acronym. 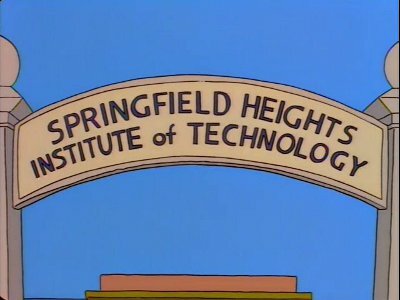 I remember joking with a college buddy about that Simpsons episode, and he mentioned that his college, Stevens Institute of Technology, was once a S.H.I.T. school (Stevens Hopkins, I believe, though I can't seem to find confirmation of this). The typical example is actually Sam Houston Institute of Technology, but like most of these, it appears to just be an urban legend (along with many other organization acronyms that break down into curse words). Anyway, this beer is billed as the "more affable" version of Black Tuesday, The Bruery's massive 19% ABV Bourbon Barrel Aged Imperial Stout. Clocking in at 14% ABV, this... isn't that much more affable, but given the large bottle formats, I'll take it. I drank this on a Friday, but heck, I'll review it on a Tuesday. Beer Nerd Details: 14% ABV bottled (750 ml). Drank out of a tulip glass on 2/5/16. Bottled: 12/03/15 (2016 Edition). 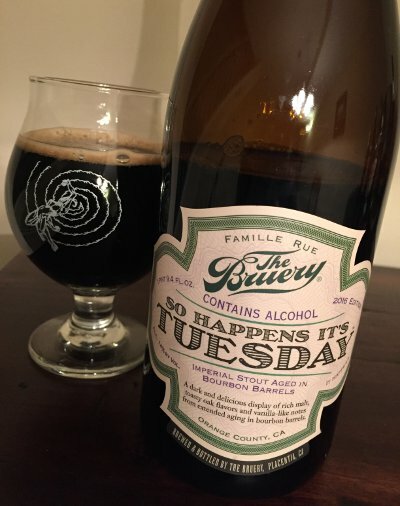 Believe it or not, I actually had a few ounces of Black Tuesday just a few days before this one (at a share) as well as Wineification III (which is Black Tuesday aged on French Oak with wine grapes), and while they are both quite intense, they also seemed more integrated. Balanced is not a really a term you use with a beer like Black Tuesday, but for it's richness, intensity, and alcohol level, it kinda is balanced. I am, of course, ever on the lookout for other variants (of which, there are many! ), though I don't have plans to tackle any of those anytime soon. This page contains a single entry by Mark published on February 9, 2016 11:08 PM. Birra Del Borgo Duchessic Ale was the previous entry in this blog. Civil Disobedience #14 is the next entry in this blog.